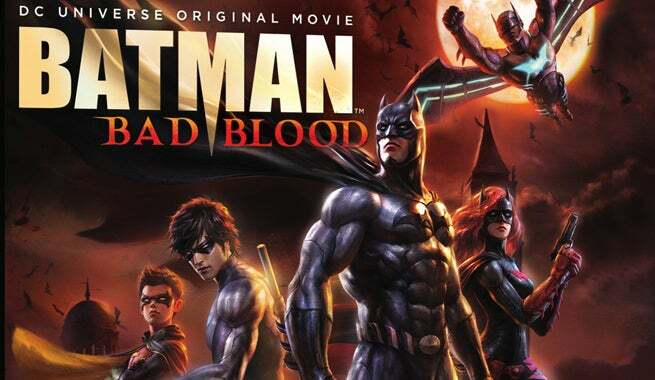 A trailer and release dates for Batman: Bad Blood, the next DC animated movie in their shared universe, were revealed today by Warner Home Entertainment. The movie will hit digital HD on January 19, 2016, and come to Blu-ray Deluxe Edition ($29.96), Blu-ray Combo Pack ($24.98) and DVD ($19.98) on February 2, 2016. The Deluxe Edition includes an exclusive Nightwing action figure and is a numbered limited edition. "The mysterious disappearance of Batman, coupled with the emergence of powerful and malevolent new villains in Gotham City, force Nightwing (voice of Sean Maher) and Robin (Stuart Allan) to take crime-fighting into their own hands – while simultaneously searching for their missing leader. They’re not alone for long. New super heroes Batwoman (Yvonne Strahovski) and Batwing (Gaius Charles) – each armed with her/his own sensibilities, physical abilities and crime-fighting tools – arrive in Gotham to assist in the cause. As this new “family” strives to find its own dynamic, chilling clues lead the group to suspect the Dark Knight may have gone over to the dark side. It’s up to the entire Bat team to uncover the truth before Gotham City falls prey to its greatest threat yet." The home releases on Blu-ray will also feature several extras, including a sneak peek at Justice League Vs. Teen Titans, the next animated feature, and two making-of featurettes. Two episodes featuring the Bat-family from previous animated series Batman: The Brave and the Bold and Batman: The Animated Series will also be featured on the Blu-ray home releases.